well its super Di, and you would never know it was short notice! That's absolutely gorgeous, Di! Hope Gregg's well impressed. Wow Thats so classy, Lovely. Oooooh, that's gorgeous Di. Love how you've placed all the elements. Just fabulous hun. Thanks all. The nice thing is the original invite (which he's had for about two months) was hand made, so hopefully they will appreciate a hand made card. Even Gregg said it's pretty! 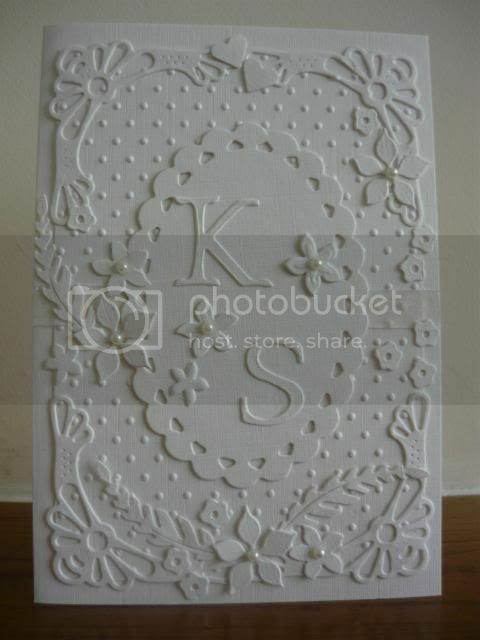 White on white always looks sophisticated, a cracking card, double well done for the short notice. I hope he paid well!! well my visitors are on the way back ip to scotland . weve had a whale of a time ..all of us loved every minute of it as we have all spent the entire weekend together apart from bedtimes . white post farm trip was fantastic. the sun came out for us and stayed all afternoon . oliver loved being there. jaxon was a little unsettled .we think the trip down was a bit much being in hiscarseat all that time . they did stop gor s full hour at scotch corner to get him out and feed etc though. another grandson who goes down to sleep early. was great in the evenings os we could just sit and chat. Not just pretty its beautiful and so crisp and clean looking.